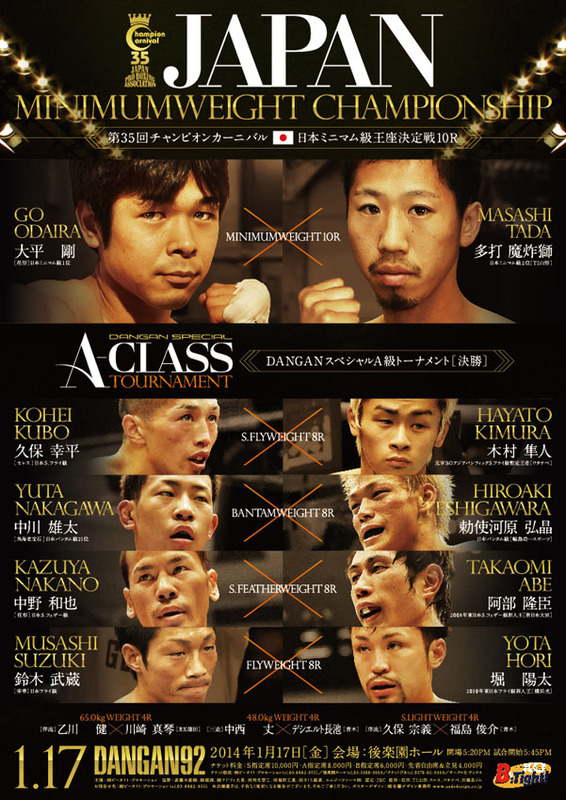 The first Japanese national title fight comes on January 17th on the second Dangan show of 2014 as Go Odaira (8-3-3, 1) takes on Masashi Tada (11-3-1, 7) for the vacant Japanese Minimumweight title. The bout, a genuinely intriguing one that features a a big hitter versus a very light hitter, is a one that genuinely has us split on who the winner is and we really can't wait for it to take place. As well as the main event we expect 6 other bouts, a number of which are shown on the poster. Unfortunately however the Yuta Nakagawa/Hiroaki Teshigawara bout, as show on the poster, has been cancelled ahead of the show. In terms of the poster it's keeping with the gold and black theme that we've become used to seeing with Dangan shows. Sure there is the cancelled bout still on the poster but that's something that can't always be helped.